Bikes, boats and bunnies – oh my! 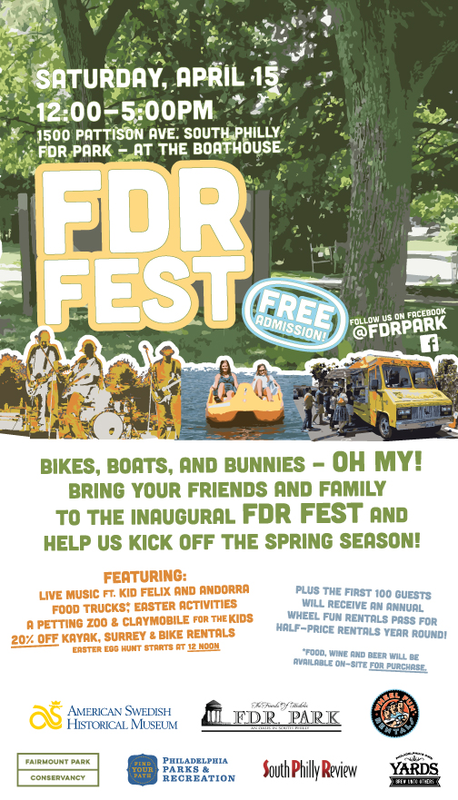 Bring your friends and family down to the inaugural FDR Fest on Saturday, April 15th and help us kick off the spring season! Enjoy a day of live music, food and fun in the park. The day’s line-up includes live music from local performers Kid Felix and Andorra; food, wine and Yards beer for purchase (including some of Philly’s favorite mobile food vendors The Cow and the Curd, Nic’s Roast Beef, and Farm Truck); and special Easter-themed activities for kids including the Claymobile, petting zoo, egg hunt and special appearance by the Easter Bunny. And in case you didn’t know, part of the proceeds from Wheel Fun supports improvements in Philly’s parks. PLUS Wheel Fun Rentals at FDR Park Boathouse will feature paddle boat and kayak rentals for on-the-lake fun plus surreys and two wheel bikes to experience FDR Park in a new whole way. Receive a 20% discount on all rentals at FDR Fest. Get there early! The first 100 guests will receive an annual Wheel Fun pass for half-price rentals year round. Bikes, boats, and bunnies – oh my! Bring your friends and family down to the inaugural FDR Fest on Saturday, April 15th and help us kick off the spring season! Enjoy a day of live music, food, and fun in the park for the whole family. The day’s line-up includes live music from local performers AZN Jake, Kid Felix, and Andorra; food, wine and beer for purchase (including some of Philly’s favorite mobile food vendors The Cow and the Curd, Nick’s Roast Beef, and Farm Truck); and special Easter-themed activities for kids including the Claymobile, petting zoo, special appearance by the Easter Bunny and the popular egg hunt starting promptly at noon (12 pm)! FDR Fest happens on Saturday, April 15 from 12:00-5:00pm (rain date April 22nd) in South Philadelphia, near the stadiums. FDR Park is a 5-minute walk from AT&T Station plus ample free parking onsite.